According to Kola Abimbola, the Yoruba have evolved a robust cosmology. In brief, it holds that all human beings possess what is known as "Ayanmo" (destiny, fate) and are expected to eventually become one in spirit with Olodumare (Olorun, the divine creator and source of all energy). Furthermore, the thoughts and actions of each person in Ayé (the physical realm) interact with all other living things, including the Earth itself. Each person attempts to achieve transcendence and find their destiny in Orun-Rere (the spiritual realm of those who do good and beneficial things). One's ori-inu (spiritual consciousness in the physical realm) must grow in order to consummate union with one's "Iponri" (Ori Orun, spiritual self). Those who stop growing spiritually, in any of their given lives, are destined for "Orun-Apadi" (the invisible realm of potsherds). Life and death are said to be cycles of existence in a series of physical bodies while one's spirit evolves toward transcendence. This evolution is said to be most evident amongst the Orishas, the divine viziers of Olorun. Iwapẹlẹ (or well-balanced) meditative recitation and sincere veneration is sufficient to strengthen the ori-inu of most people. Well-balanced people, it is believed, are able to make positive use of the simplest form of connection between their Oris and the omnipotent Olu-Orun: an adura (petition or prayer) for divine support. Prayer to one's Ori Orun produces an immediate sensation of joy. Elegbara (Eshu, not the divine messenger but accuser of the righteous) initiates contact with spiritual realm (not heavenly places) on behalf of the petitioner, and transmits the prayer to Ayé; the deliverer of ase or the spark of life. He transmits this prayer without distorting it in any way. Thereafter, the petitioner may be satisfied with a personal answer. In the event that he or she is not, the Ifá oracle of the Orisha Orunmila may also be consulted. All communication with Orun, whether simplistic in the form of a personal prayer or complicated in the form of that done by an initiated Babalawo (priest of divination), however, is energized by invoking ase. In the Yoruba belief system, Olodumare has ase over all that is. Hence, Is considered supreme. Olodumare is the most important "state of existence". Regarded as being all-encompassing, no gender can be assigned. Hence, it is common to hear references to "it" or "they" (although this is meant to address a somewhat singularity). "They" are the owner of all heads, for during human creation, Olodumare gave "emi" (the breath of life) to humankind. In this, Olodumare is Supreme. Perhaps one of the most important human endeavors extolled within the Yoruba literary corpus is the quest to improve one's "Iwa" (character, behaviour). 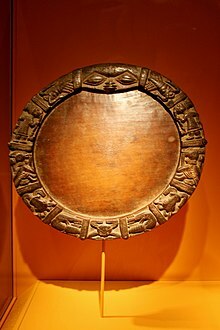 In this way the teachings transcends religious doctrine, advising as it does that a person must also improve his/her civic, social and intellectual spheres of being; every stanza of the sacred Ifá oracular poetry (Odu Ifa) has a portion covering the importance of "Iwa". Central to this is the theme of righteousness, both individual and collective. The Yoruba regard Olodumare as the principal agent of creation. According to a Yoruba account of creation, during a certain stage in this process, the "truth" was sent to confirm the habitability of the newly formed planets. The earth being one of these was visited but deemed too wet for conventional life. After a successful period of time, a number of divinities led by Obatala were sent to accomplish the task of helping earth develop its crust. On one of their visits to the realm, the arch-divinity Obatala took to the stage equipped with a mollusk that concealed some form of soil; winged beasts and some cloth like material. The contents were emptied onto what soon became a large mound on the surface of the water and soon after, the winged-beasts began to scatter this around until the point where it gradually made into a large patch of dry land; the various indentations they created eventually becoming hills and valleys. Obatala leaped onto a high-ground and named the place Ife. The land became fertile and plant life began to flourish. From handfuls of earth he began to mold figurines. Meanwhile, as this was happening on earth, Olodumare gathered the gases from the far reaches of space and sparked an explosion that shaped into a fireball. He subsequently sent it to Ife, where it dried much of the land and simultaneously began to bake the motionless figurines. It was at this point that Olodumare released the "breath of life" to blow across the land, and the figurines slowly came into "being" as the first people of Ife. For this reason, Ife is locally referred to as "Ife Oodaye" - "cradle of existence". An Orisha (spelled Òrìṣa) is an entity that possesses the capability of reflecting some of the manifestations of Olodumare. Yoruba Orishas (commonly translated unique/special/selected heads") are often described as intermediaries between humankind and the supernatural. The term is also translated as "Deities" or "Divinities" or "Gods". Orisha(s) are revered for having control over specific elements by nature, thus being better referred to as the divinities or Imole. Even so, there are those of their number that are more akin to ancient heroes and/or sages. These are best addressed as Dema Deities. Even though the term Orisha is often used to describe both classes of divine entities, it is properly reserved for the former one. Orunmila / Ọ̀rúnmìlà The Yoruba Grand Priest and custodian of the Ifa Oracle, source of knowledge who is believed to oversee the knowledge of the Human Form, Purity, the Cures of illnesses and deformities. 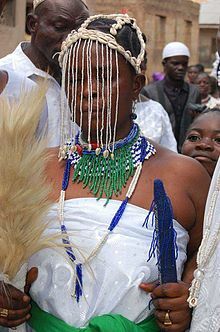 Babalawos are Orumila's subordinate as priests and followers. Eshu / Èṣù Often ill-translated as "The Devil" or "The Evil Being", Eshu is in truth neither of these. Best referred to as "The Trickster", he deals a hand of misfortune to those that do not offer tribute or are deemed to be spiritual novices. Also regarded as the "divine messenger", a prime negotiator between negative and positive forces in the body and an enforcer of the "law of being". He is said to assist in enhancing the power derived from herbal medicines and other forms of esoteric technology. Eshu is the Orisha of chance, accident and unpredictability. Because he is Olorun's linguist and the master of languages, Eshu is responsible for carrying messages and sacrifices from humans to the Sky God. Also known for his phallic powers and exploits. Eshu is said to lurk at gateways, on the highways and at the crossroads, where he introduces chance and accident into the lives of humans. Known by a variety of names, including Elegbara. Ogoun / Ògún Orisha of iron and metallurgy. Yemoja / Yemọja Mother of Waters, Nurturer of Water Resources. According to Olorishas, she is the amniotic fluid in the womb of the pregnant woman, as well as the breasts which nurture. She is considered the protective energy of the feminine force. Oshun / Ọ̀ṣun A second wife of the former Oba of Oyo called Shango (another Yoruba Orisha, see below), she is said to have entered into a river at Osogbo. The Yoruba clerics ascribed to her Sensuality, Beauty and Gracefulness, symbolizing both their people's search for clarity and a flowing motion. She is associated with several powers, including abilities to heal with cool water, induction of fertility and the control of the feminine essence. Women appeal to her for child-bearing and for the alleviation of female disorders. The Yoruba traditions describe her as being fond of babies and her intervention is sought if a baby becomes ill. Oshun is also known for her love of honey. Shango / Ṣàngó Associated with Virility, Masculinity, Fire, Lightning, Stones, Oyo Warriors and Magnetism. He is said to have the abilities to transform base substances into those that are pure and valuable. He was the Oba of Oyo at some point in its history. He derived his nickname Oba Koso from the tales of his immortality. Shango is the Orisha of the thunderbolt, said to have ruled in ancient times over the kingdom of Oyo. Also known as Jakuta (Stone Thrower) and as Oba Koso (The King Does Not Hang). Oya / Ọya The third wife of the former Oba of Oyo called Shango (another Yoruba Orisha, see above), she is said to have entered into the River Niger. She is often described as the Tempest, Guardian of the Cemetery, Winds of Change, Storms and Progression. Due to her personal power, she is usually depicted as being in the company of her husband Shango. Orisha of rebirth. The Yoruba believe in Atunwa, reincarnation within the family. The names Babatunde (father returns), Yetunde (Mother returns), Babatunji (Father wakes once again) and Sotunde (The wise man returns) all offer vivid evidence of the Ifa concept of familial or lineal rebirth. There is no simple guarantee that your grandfather or great uncle will "come back" in the birth of your child, however. Whenever the time arrives for a spirit to return to Earth (otherwise known as The Marketplace) through the conception of a new life in the direct bloodline of the family, one of the component entities of a person's being returns, while the other remains in Heaven (Ikole Orun). The spirit that returns does so in the form of a Guardian Ori. One's Guardian Ori, which is represented and contained in the crown of the head, represents not only the spirit and energy of one's previous blood relative, but the accumulated wisdom he or she has acquired through myriad lifetimes. This is not to be confused with one’s spiritual Ori, which contains personal destiny, but instead refers to the coming back to The Marketplace of one's personal blood Ori through one's new life and experiences. The Primary Ancestor (which should be identified in your Itefa) becomes – if you are aware and work with that specific energy – a “guide” for the individual throughout their lifetime. At the end of that life they return to their identical spirit self and merge into one, taking the additional knowledge gained from their experience with the individual as a form of payment. The Vodun faith, which originated amongst a different ethnic group (the Gbe speaking peoples of present-day Benin, Togo, and Ghana), holds influential aspects on the African diaspora in countries such as Haiti and Cuba, also New Orleans, Louisiana in the United States. Yoruba "Chrislam" includes two distinct religious movements, one called Ifeoluwa founded by Tela Tella in the 1970s and 80s and another called Oke-Tude founded by Samson Saka in 1999. They are also known as The Will of God Mission or The True Message of God Mission respectively. Adherence to "Chrislam" in Nigeria is very limited; Soares (2009) notes that "such efforts towards religious fusion or synthesis seem to be rather exceptional and increasingly so. In many places there has been intense competition and higher levels of tension within and between different confessional groups." Ifeoluwa ("Love of God") recognises both the Bible and the Quran as holy texts, and practices "running deliverance," a distinctive practice of spiritual running likened to Joshua's army circling Jericho, or the practice of Pilgrims circumambulating a Church for Palm Sunday or the Kaaba, and Jews around the Synagogue during Sukkot. In contrast to other Chrislamic sects, Tela Tella, while claiming to believe in both the Qur'an and the Bible, says they are incomplete, and is writing his own book called the "Ifeoluwa Book". Tela Tella claims that an angel of God came to him and told him that he gave him the mission and the name "Ifeoluwa: The Will of God Mission". Oke Tude (Oketude) in Ogudu (a northern suburb of Lagos), founded by Samson Saka in 1999, is slightly less recognisable to mainstream Christianity, resembling more interfaith worship with three different sessions or services that take place on Sunday. The first is a Muslim session, then a Christian session, and finally there is a joint session that Saka leads. During this he stresses the similarities between Christianity and Islamic beliefs. In Latin America, Yoruba religion has been on intense Syncretism with Christianity, Indigenous religions and Spiritism since the first arrival of African immigrants. On Brazil, the religion of Umbanda was born from the rich interaction of beliefs that Latin America provided. Followers of Umbanda typically consider themselves Monotheistic, but honor Catholic Saints and Orisha as manifestations from god or as Tutelary deities. Umbanda worship also include elements from Native South American rituals such as the ritual use of Tobacco and communication with the spirits of deceased Indian warriors (Caboclo). In the 1949 documentary Fiestas de Santiago Apóstol en Loíza Aldea, anthropologist Ricardo Alegría noted a similar tendency at Loíza, Puerto Rico, arguing that the affinity between the black population in the municipality and the Catholic saint Santiago Apóstol may derive from the way in which he is depicted as a warrior; a similar theme to some depictions of Shango. This theory supposed that this resemblance was used by the population as a covert form to honor their ancestral deity. ^ a b c Abimbola, Kola (2005). Yoruba Culture: A Philosophical Account (Paperback ed.). Iroko Academics Publishers. ISBN 1-905388-00-4. ^ a b c d Ọlabimtan, Afọlabi (1991). Yoruba Religion and Medicine in Ibadan. Translated by George E. Simpson. Ibadan University Press. ISBN 978-121-068-0. OCLC 33249752. ^ a b c Ọlabimtan, Afọlabi (1973). Àyànmọ. Lagos, Nigeria: Macmillan. OCLC 33249752. ^ a b c d e Bolaji Idowu (1982). Olódùmarè: God in Yoruba Belief. Ikeja, Nigeria: Longman. ISBN 0-582-60803-1. ^ Ifaloju (February 2011). "Odù-Ifá Iwòrì Méjì; Ifá speaks on Righteousness". Ifa Speaks... S.S. Popoola, Ifa Dida, Library, INC. Retrieved 8 April 2012. ^ Leeming & Leeming 2009 – entry "Yoruba". Retrieved 2010-04-30. ^ Courlander, Harold (March 1973). Tales of Yoruba Gods and Heroes. Crown Pub. ISBN 978-0517500637. ^ Neimark, Philip John (28 May 1993). The Way of the Orisa (1st ed.). HarperOne. ISBN 978-0-06-250557-6. Retrieved 2012-04-08. ^ a b Akintoye, Prof S. A. (2010). A history of the Yoruba people. Amalion Publishing. ISBN 2-35926-005-7. ASIN 2359260057. ^ Brown (Ph.D.), David H. (2003). Santería Enthroned: Innovation in an Afro-Cuban Religion. University of Chicago Press. ISBN 0-226-07610-5. ^ Oditous (2010). "Anthropology: [Yoruba]". Anthrocivitas Online. Retrieved 2011-03-27. ^ Karade, Baba Ifa (1994). The Handbook of Yoruba Religious Concepts. York Beach, New York: Weiser Books. ISBN 0-87728-789-9. ^ Fandrich, Ina J. (2007). "Yorùbá Influences on Haitian Vodou and New Orleans Voodoo". Journal of Black Studies. 37 (5 (May)): 775–791. doi:10.1177/0021934705280410. JSTOR 40034365. ^ McLaughlin, Abraham (January 26, 2006). "In Africa, Islam and Christianity are growing - and blending". The Christian Science Monitor. ^ Benjamin Soares, "An Islamic social movement in contemporary West Africa: NASFAT of Nigeria"in : Stephen Ellis and Ineke Van Kessel (eds.) Movers and Shakers: Social Movements in Africa (2009), p. 181. Hernández, Carmen Dolores (2002). Ricardo Alegría: Una Vida (in Spanish). Centro de Estudios Avanzados del Caribe, Fundación Puertorriqueña de las Humanidades, Instituto de Cultura Puertorriqueña, Academia Puertorriqueña de Historia. ISBN 1563282100. Leeming, David Adams; Leeming, Margaret Adams (2009). A Dictionary of Creation Myths (Oxford Reference Online ed.). Oxford University Press. 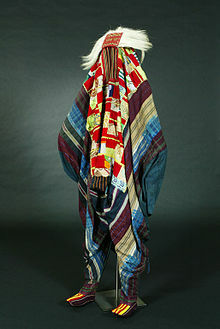 Wikimedia Commons has media related to Yoruba religion. Yoruba Movies & Films Yoruba Theatre is the origin of Nigeria's Nollywood, the equivalent of America's Hollywood.